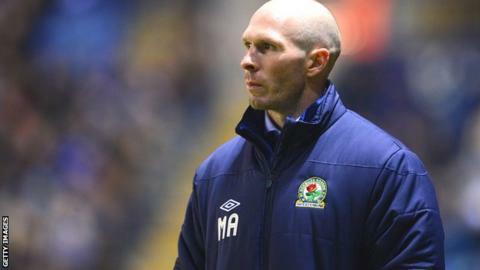 Blackburn manager Michael Appleton wants to add at least one new signing to his injury-hit squad before the visit of Peterborough on Saturday. in the past week, which has coincided with a three-match winless run for Rovers. "I'll be amazed if we haven't got a couple of players in by Saturday," Appleton told BBC Radio Lancashire after Tuesday's 3-0 loss to Leicester. "I hope they can have a positive impact." The Rovers boss added: "I've got make sure I get the balance right, in terms of bringing in players that are going to actually play in the 11. There's no point me bringing in players that are going to sit on the bench." Lee Williamson, Colin Kazim-Richards (both ankle) and Martin Olsson (eye) have all picked up fresh injuries in recent days, while midfielder Dickson Etuhu has suffered a setback in his recovery from a knee problem. The loss at Leicester kept the gap between 11th-placed Rovers and the play-off positions to seven points. "We are where we are for a reason because we've not hit the high standards that the opposition have," said the former Portsmouth and Blackpool boss. "The table doesn't lie. "It's difficult for Premier League sides when they come down to adjust and learn what the division is all about. "I think the next 12 games has got to be about the detail of making sure we build bridges and doing the simple things right. "Hopefully in those 12 games, I'll see good signs of where we can go and make sure we can push on at some point."